← Have you tried DLM Dashboard? 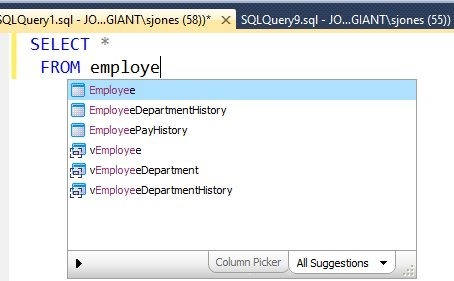 I love SQL Prompt and use it constantly. When I don’t have it, my code writing process slows to spurts and stutters, and it’s painful. I usually want the object name to appear, but I hate seeing the definitions. That’s rarely useful to me. I can turn that off with a quick setting change. If I choose SQL Prompt from the menu and select Options, I’ll get a dialog with a number of sections on the left. 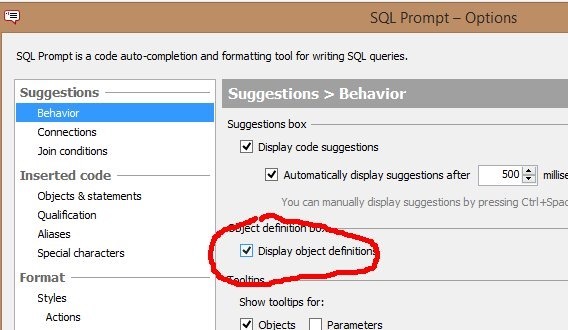 The one that pops up first should be “Behavior” and there’s a checkbox in this for “Display Object definitions (see the image below). If I uncheck this, then I still get the list of objects, but no definition. The view in this image is a much easier way for me to write T-SQL code. You can see this noted in the SQL Prompt docs.